UFA is a 501(c)(5) non profit trade association. Contributions or gifts to UFA are not tax deductible as charitable contributions. However, they may be tax deductible as ordinary and necessary business expenses. 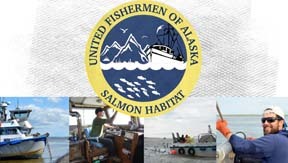 UFA Individual and Lifetime Memberships are available to any Alaska commercial fishing permit holder (including federal fisheries), an Alaska licensed commercial crew license holder, or a UFA gear group individual member or employee. Individual and Lifetime UFA members are eligible to run and vote in elections for four at-large UFA Board member seats every two years. UFA Crew / Supporter Membership is available to all others. Or, print Individual / Crew / Lifetime Membership Application Form (.pdf). UFA Individual, Lifetime and Crew members receive free subscriptions to both National Fisherman and Pacific Fishing Magazines. UFA members also receive monthly UFA news updates. If you are not currently receiving UFA email updates, please make sure that we have your current email address on your form, or by sending an email to ufa@ufa-fish.org. UFA thanks you in advance for your support of the seafood industry in Alaska. UFA is proud to support our Business Members. UFA Business Memberships are available to any individual, municipality or company, not holding an Alaska commercial fishing permit, who wishes to support the Alaska seafood industry. Business Members are featured on the UFA website on the Business Member page. UFA members are encourage to patronize businesses that display the UFA logo sticker. UFA also finds frequent opportunities to promote our business members throughout the year. Or, print Business Membership Application Form (.pdf). Visit About Us page for more information on UFA. Please contact UFA office for information on ‘Organization Membership’.